Krishna consciousness is attractive, yet one needs to be attentive in his or her practices. Otherwise a life centered on sense gratification lures us to give up our spiritual practices. Slowly but surely, one could abandon Krishna for maya, the illusory energy of the Lord. Just as a person suffering from typhoid is diagnosed by the symptoms he exhibits, a person suffering from lack of taste in Krishna consciousness and on the verge of a downfall can be recognized by certain symptoms. The Fifth Canto of Srimad- Bhagavatam reveals the plight of Emperor Bharata, a king who relinquished his unparalleled wealth and position as the ruler of this planet to practice exclusive devotional service to God. He reached the Pulaha-asrama on the banks of River Gandaki and performed rigorous austerities and rituals remembering the Lord. By his sincerity he reached the stage of bhava, the preliminary stage of love of Godhead, and showed ecstatic symptoms of love for God. Tears of affection for the Lord automatically swelled up in his eyes and his body trembled in ecstasy as he thought of the Lord’s various pastimes. Although he reached such a rare, exalted stage in his spiritual practices, he fell from his position. We could learn from his mistakes. 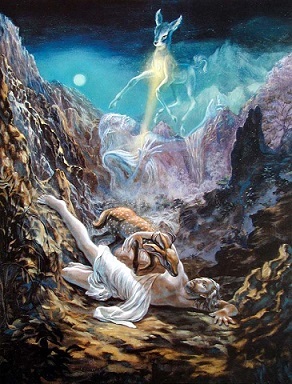 One day as he was performing his daily practices, he saw a pregnant doe terrified by the roaring of a lion, and she immediately delivered her child that fell into the river. While the mother died, the baby deer was swept by the river’s strong current. Instantly Bharata Maharaja leapt into the river and saved the newborn. 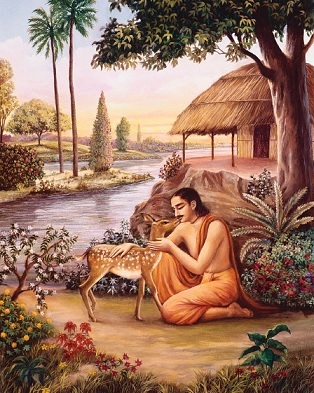 Feeling compassion for the young deer that was rendered motherless, Bharata took care of her by tending to the smallest of the needs of the animal. While the act of compassion is glorious, in the process he reduced his own spiritual practices. He spent a good amount of time petting and caressing the deer, collecting food for the animal, and playing with it. Soon his distraction caused him to forget his basic spiritual practices. Just as a strong wind may pull away the plane from its course but the pilot expertly redirects it on course, similarly it’s natural that the distractions and temptations of this world pull away even a sincere practitioner from his spiritual program. Yet his glory lies in coming back on track. Bharata Maharaja, however, failed to redirect the lost plane of his consciousness back to absorption in the Lord. He began to justify his lower standards by saying it’s natural and reasonable to reduce one’s spiritual standards for the glorious service of taking care of a helplessly dependent animal such as this innocent deer. He forgot that he had left his huge palace and riches for pursuing God realization but now a small deer had clouded his intelligence so much that he justified his reduced spiritual standards. Once we reduce our standards and, worse, we give excuses to justify them, then it’s natural that our little spiritual practices we are performing would be a mechanical affair. Bharata Maharaja was so absorbed in remembering the deer that while plucking flowers for his worship of the Lord, he thought of the little animal. He closed his eyes in meditation of the Lord, but thought of the deer. Then as the little animal came close to him expecting affection, he feigned absorption in his practice, while he stole glances at his pet. He then placed the deer on his lap, and performed a cursory ritual of worship. If our practices are ritualistic, it is only a matter of time before we feel choked up in its execution. We would wish we were doing something else rather than these practices where anyway our mind is not absorbed. Bharata Maharaja felt restless when he saw his deer was missing. He could no longer do even the basic spiritual functions; he was desperate to be reunited with the deer, and searched for her everywhere. He gave up his practices and felt restless in his asrama. Remembering the deer, he soon gave up his body. Since while dying he remembered the animal, he was born as a deer in his next life. However due to his sincere practices, he was awarded the remembrance of his lapse of previous life. By being cautious of unnecessary distractions, he remained alert in his practices and eventually perfected his life. For sincere spiritual practitioners, the dangers on this path are clear. If we reduce our standards or justify our lapses and allow our practices to become a ritualistic affair, we would soon become restless in Krishna consciousness. We would then prefer to live outside the association of devotees and eventually give up our Krishna conscious practice.